The first obstacle to getting started in the 2,000 year old silk string qin tradition is acquiring an instrument. It is somewhat easier getting started in the nylon-metal string guqin tradition,3 though it dates only from the Cultural Revolution and has quite a different aesthetic.4 It is easier because, although the traditional aesthetic requires the use of silk strings, qin makers today almost exclusively construct their instruments for use with the nylon-metal strings (sometimes mis-represented as "new silk"); these instruments tend to be structurally different in several ways.5 Some of these modern specimens may work fine with silk strings, but the only way to find out is to remove the metal strings and test them with silk (regarding which see "availability"). This is quite a laborious process. In general, unless you are confident of your ability to find a good instrument yourself, I recommend going to someone like Tong Kin-Woon in Hong Kong. He has hundreds of new instruments (as in the image above), including antiques, instruments by well-known makers and factory ones he especially selected from Yangzhou. He can give good advice on quality and so the result is likely to be better than going directly to a mainland source. However, I am currently somewhat out of touch on this. In several appendices ending with the 2018 update there is some updated but often outdated information on ordering instruments online. Unfortunately, it mostly concerns non-silk string instruments. Personally, I generally use one of my qins made by He Mingwei (see issues in the next paragraph) or my Wang Peng banana leaf qin, and I can recommend the basic Wang Peng instruments for beginners. However, they are not cheap: with the strengthening of Chinese yuan, his basic instruments generally start at about US$1,800 (including shipping; he has "practice qins" for less). For performance, for many years my main instruments have been the ones by He Mingwei. However, mine are all somewhat larger than the standard modern ones, which now all seem designed to fit into the standard modern qin case, and with airlines now making it more difficult to carry the instruments on board, depending on details of the flight I may be reluctant to use my soft cases. In these situations I use my Wang Peng banana leaf qin. In general the finishing of my He Mingwei qins was unexceptional,13 but mine have a very good silk string sound. He stopped making qins some years ago, then began again recently. Although most of these are now aimed mainly at the metal string market, he is said occasionally to make specifically silk string ones. As for some of the other well-known makers, such as Zeng Chengwei, also of Chengdu, and Li Mingzhong of Xi'an, although some of their older instruments would have been designed for silk strings, to my knowledge for many years their instruments have all been aimed at the metal string market. In all these cases, though, specific instruments by any such maker might work fine with silk strings but, once again, the only way to determine this is actually to string them with silk and play them. why take the trouble of putting on the strings to play it?" There is probably no connection between this philosophical point of view and the fact that many of the best old instruments are unplayed, belonging either to collectors who don't play or to museums that don't allow them to be played (Qins in captivity?). The quality of instruments available ranges from very bad to exquisitely good, so if you want to take the trouble actually to play you must decide whether to begin with a cheap instrument probably designed for the modern nylon-metal string market or to try to begin with a better instrument, which would make it easier to follow the ancient silk string tradition. While I can mention here a few guidelines in selecting one, I don't at all consider myself a specialist in this area. Some people apparently can tell the quality simply by knocking on the body with their knuckles and playing a few notes. I cannot do this. 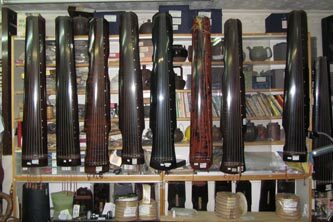 If you see a qin in a general Chinese music/music instrument store, almost certainly it is a glossy factory made instrument. In 1979, in the Cantonese feature film House of the Lute, for which I provided the music, an actor pretended to play such an instrument while I provided music with my own qin. Other than that, the film used it in two ways that at the time seemed most appropriate for such an instrument: it hung on a wall (with strings: one night a string broke, strangling a rat in the process); and it was subsequently used to bludgeon the old man to death. Some shops perhaps can tell you about qin teachers. In this case you should try to contact the teacher and ask for advice. My biggest problem in testing qins is, as mentioned, that almost invariably they come with metal strings on them. It is my observation that almost all qins today are tested with metal strings during the construction process. Since the best qins for use with metal strings are not necessarily the best qins for use with silk strings this means that for me to judge a qin I must first take it home, put on silk strings and try it in the dead of night, perhaps for several weeks. In the United States the major source of metal string qins is via the website of Wang Fei's North American Guqin Association, in the San Francisco area. Her catalogue sometimes indicates that an instrument can be used with silk strings, but since to my knowledge Wang Fei rarely uses silk strings,15 this information is difficult to verify. Most of the instruments I play today I acquired while living in Hong Kong, i.e., before 2000, and mostly through 唐健垣 Dr. Tong Kin-Woon (TKW). Most of the information in the footnotes below come from him, supplemented by advice from other interested people. Dr. Tong is himself is a qin maker and repairer as well as a player and scholar. The qins he makes have a marvelous sound. He also personally selects instruments from China to re-sell in Hong Kong. Unfortunately, he does not keep any strung with silk strings. Photo taken at the studio of Tong Kin-Woon in Hong Kong. Here Dr. Tong teaches qin, sells them and also repairs them (details). It is easy to find inexpensive qins in China, and also quite possible in the USA. There is some information on this below in the 2912 and 2018 updates. Nylon-metal strings were developed during the Cultural Revolution as part of an effort to turn the qin from an inward instrument of self-cultivation to an outward instrument of performance. The playing techniques required of the two different types of strings are very different. Pointing this out is not intended as a criticism of the nylon-metal strings, which have their own advantages. 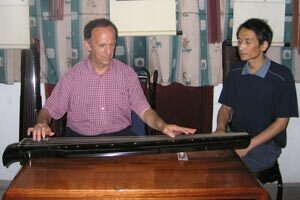 Wang Peng says that the main differences between his qins for use with silk strings are in three areas. The shape of the sound box is somewhat different. It is not clear to what extent Wang Peng actually makes instruments specifically for use with silk strings: his better instruments are said to be designed for silk strings, but many are used with metal strings, this still being his main market in spite of his promotion of the silk string tradition. It should also be pointed out that his design of the sound chamber is modern: instead of the traditional sound posts he makes his instruments thicker on the side with the lower strings. Some teachers in China provide a space where beginners can practice without buying a qin right away. Of course, one aim is to encourage the student to buy from the teacher. Rather more sinister are stories I have heard of teachers at conservatories telling students that if they expect a good grade they must buy a good qin, i.e., one from them. Both of these are factors contributing to the high price of qins in China. They also are indicative of the fact that higher price does not necessarily mean a better instrument. It also contributes to the difficulty of finding instruments good for use with silk strings, since few teachers in China use them. As of 2009 Wang Peng said that he did not use the new silk strings by Pan Guohui (see Fang Yuting), and the silk string qins I saw by him all had strings by Huang Shizhi, which were in very limited supply. Then when I visited him again in 2012 he strung one of his qins with Pan Guohui strings. The impression I have is that he sells very few silk string qins. Ni is probably providing silk strings for some of his guqin because of his association with 王鐸 Wang Duo, a Suzhou qin player who actively promotes silk string qins. I recently bought for under $1,000 and had shipped to the US an excellent instrument strung with the silk strings being made by Pan Guohui. Although these strings are not always of very high quality, the better ones are quite acceptable once they are broken in. I have not in fact seen any of his recent silk string qins, only heard that he makes them on special order and that they are very expensive. Initially I had the lacquer on my qins made more smooth by getting a violin maker to rub the surface with a special cloth). Later, after further damage was caused when checking in my qin for trans-Pacific flights, largely due to the change in temperature in the unpressurized airplane luggage compartment, I gave them to Wang Peng for further repair. Their appearance improved considerably as a result. See Assemblage of the inner top: placing the sound posts requires considerable skill. See also the further comments under Qin Construction (search for "sound posts" and "metal strings"). As of 2006 the "Listening Room" on Wang Fei's website includes one track of her playing with silk strings, so perhaps this situation may change. On the other hand her statements about her "Naga new silk" strings suggest that her ideas about traditional qin sound are rather different from my own. As of 1998 there were about 16 factories in Yangzhou making guqin. There were also qin factories in several other parts of China, including Beijing and Shanghai. Sometimes they look nice and shiny, but the sound is rarely any good. Often they are painted rather than lacquered, and have hidden structural flaws. The wood may be untreated, hence crack easily. On the other hand, some of these instruments are quite good. Recently there has been a mini-boom in the demand for qins, and quite a few are being made with false cracking, which gives them something of the appearance of age. There are also some qin makers in Hong Kong and Taiwan, but the cost tends to be higher than products of similar quality from China. In addition, there are a number of individuals in China and elsewhere who have made a few qins, some of them of very good quality, but these are harder to find. Some are made only for personal use. good wood is available in Guizhou and Mr. Li apparently has been advised by Shanghai player Gong Yi, so that some of his instruments may be a good bargain. Yan Ming (嚴明) has been working with TKW to make instruments, some quite good, starting about US$2,000; output is still very small, though. a variety of sources, with prices from about US$500 on up (see below). As mentioned above, I have a number of new instruments by He Mingwei. The basic sound is very good, but he was rather casual about the finish, typically using ceramic instead of deer horn powder in the lacquer (more recently he is apparently sometimes using deer horn powder), and not rubbing the surface to optimum smoothness. Variation in price is sometimes due to sound quality, but also sometimes results from some precious stone being imbedded in the instrument or it being a copy of some famous instrument or style. In the case of Li Mingzhong, he is able to get very good old wood (some perhaps Han dynasty, though this is not necessarily the best), and some of his instruments are really very good. Yangzhou is a center for making music instruments of all types; there is good potential for qins as there is a lot of old wood available. There is also a great range of quality, from the famous and expensive qins made by 馬維衡 Ma Weiheng to the factories where the owner hires skilled woodcraftsmen who may know nothing of qins; then he gives them an instrument and asks them to copy it. The result may be a hundred or more identical instruments. Another factory might copy a great variety of styles. One is particularly known for instruments with cracks in the lacquer which look authentically old. TKW said that one of the best sources has been the factory of a Mr. Tian, because he had as advisor a certain Mr. Liu. After a time Mr. Liu made an agreement that he would be paid by being able to select for himself a certain number of instruments. Since he knew a good sound, he took the best ones; he keeps them at his home in a village an hour or so drive from Yangzhou, and sells them with a healthy markup. This is typical of the complex factors involved in buying a new qin. It is easy to go wrong if you don't know what you are doing. With an antique the problems are similar (there are a lot of fake antiques, some quite good) but the stakes are much higher. In closing I pass on this story from Dr. Tong. In 1994 Christie's sold a Ming qin for over US$100,000. The American buyers paid so much because it had the seal of a Ming prince as the maker. They didn't realize that the prince (Lu Wang) had made dozens of these not-particularly-good instruments, and so they are not much valued by knowledgeable collectors. See related information under Qin construction or return to the top. The following are some additional guidelines updated in 2012 for people who wish to play with silk strings but cannot acquire an appropriate guqin via their teacher. Instruments sold commercially almost invariably come with nylon-metal strings, which makes it difficult to give reliable advice on how they will sound with silk strings (regarding which see further above). Generally for a really inexpensive instrument I recommend a light-weight one. This is because the heavy ones are often heavy not because of the wood but because of the very thick lacquer; this makes them quite useless for playing with silk strings. If they are heavy because of the wood, then they will probably have a small tone but it could be quite pleasant. Recently I have been told that the guqins they sell for $350 are quite usable. I have not heard them myself. Peiyou Chang (Judy Chang) wrote in 2012 "this store in Taipei sells beginner qin for about US$350 not including hard case.... by@baiyue-music.com is their e-mail address. You can write to Mrs Tian to order anything from them." Peiyou then added that this may be the "teacher price" - for ordinary people it may be somewhat higher. This site is based in Xiamen, Fujian province. It is also possible within the USA (and perhaps Europe) to buy a guqin off the internet. If this is done through a medium such as Ebay it could be very risky. If ordered directly from a maker in China shipping usually runs about $100 to $200 and it is probably necessary to be able to communicate in Chinese. For price and selection it is, of course, best to go directly to the maker (such as those mentioned above. Since this means traveling to China, having the ability to speak Chinese (or having a friend who can interpret), and already knowing something about guqins, hence the recommendation to rely on one's teacher. It is not clear to me why the street numbers are said to be 臨時 temporary. On the other hand, in Beijing I did find some very reasonably priced qins onto which 王耕 Wang Geng (who works with 素心絲絃 Suxin Silk Strings) had installed silk strings. Prices varied based on the strings requested as well as the instruments themselves.